the so-called steady charged capacitor is not steady at all. It contains energy current reciprocating from end to end at the speed of light. This experiment will actually prove this for a piece of charged coaxial cable, but such a cable is a capacitor. Until two days ago the paradox of the large square capacitor was unfinished business. 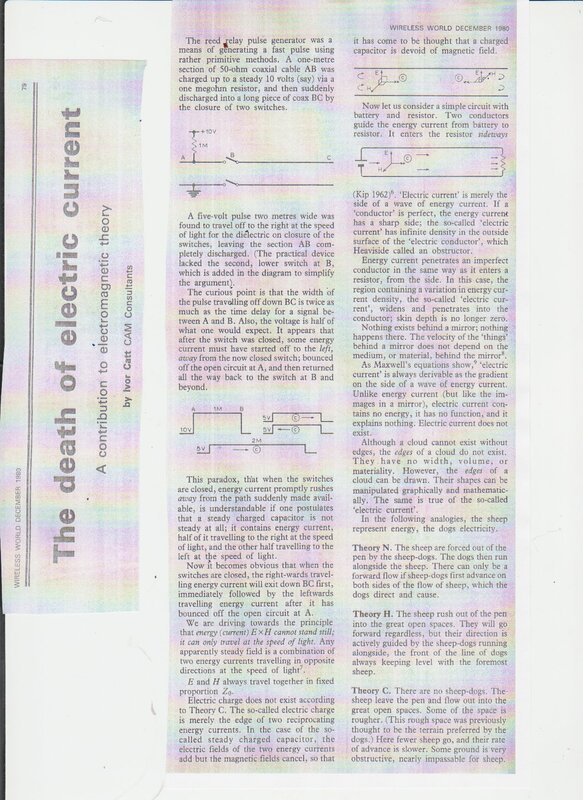 I assumed that if a large (3m square) capacitor was charged from the west end by a set of parallel entry points, such that the energy entered the capacitor as shown in Figure 3 in my article "Displacement Current" , it would discharge to the east or to the west as a half voltage amplitude, double length pulse as described in the brochure for the Tektronix 109 Reed Relay Pulse Generator. Until now, I also assumed that if an attempt was made to discharge it from the north or from the south, the same output would result. This led to the surmise that perhaps energy current travelled north and south as well as east and west, thus going faster than the normal speed of light, 300,000. However, I now realise that the ExH energy current which travels from west to east has an orientation indicated by the term ExH. Thus, the way it addresses the northern edge of the square capacitor may be different from the way it addresses the eastern edge. Reciprocating energy Current may retain knowledge of its original direction. I realise that the traditional model of a steady charged capacitor, with stationary charge all over both capacitor plates, would have to discharge in the same way from any of the four edges of the capacitor. It is the retention of vestiges of the traditional model which led me to think that “common sense” told me that the output from any of the four edges would be the same. However, with the new, reciprocating model for a charged capacitor, we are not so constrained. It means that the experiment of charging a large square (3m) capacitor from the west and then discharging it from the north could be very instructive. Would the output be the same as from the east?